How do Taxes and Spending Affect Economic Growth? 1) The sequester will likely reduce economic growth in the short run, but much less than most are predicting, including the CBO. The best estimates indicate the sequester will shave about 0.3 percentage points off GDP growth this year, but the economy will quickly recover and within two years will begin to show the positive effects of deficit reduction and a more efficient allocation of resources. 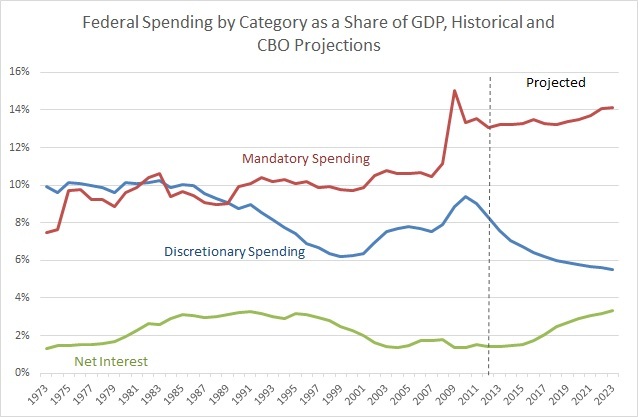 2) However, even this modest short run pain could be reduced or avoided by broadening the spending cuts to include mandatory spending, such as Social Security, Medicare, and Medicaid. These long run drivers of spending and debt are simply unsustainable and without reform will continue to take over a larger and larger share of the budget (see chart below). 3) The worst option of all, according to a huge preponderance of evidence, is to replace the sequester spending cuts with higher income taxes.